Much of Canadian History is not recorded, but is learned from stories that have been passed down from generation to generation. 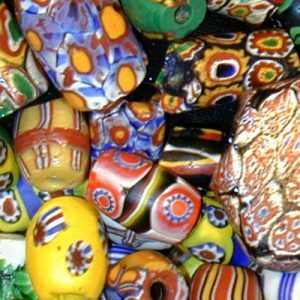 Here’s some of what we know about Historic Trade Beads. The indigenous people of northern Canada have collected and traded beads for hundreds of years. Long before Europeans crossed the Atlantic, indigenous people were making, wearing, and trading beads of shell, pearl, bone, teeth, stone and fossil. As explorers came to Canada from Europe, glass beads were introduced, used to win indigenous friendship. This was a prevalent custom in the days when European countries vied for control of the northern territories. Trade beads became an integral part of the Canadian fur trade. The indigenous people would hunt for furs and were given beads as payment. Apparently, a six foot long strand of tiny seed beads might be exchanged for a simple beaver skin. These beads were widely sought after for their colours and ease of use. Beads were also compact and easily transportable. In today’s terms, we can compare them to diamonds – we pay thousands of dollars for these small, clear stones. Certain beads became associated with certain companies. For example, the Hudson’s Bay Company bought thousands of red beads or “White Heart” beads as their trading commodity. These became known as the “Hudson’s Bay” bead. They carried an exchange value of six beads to one beaver pelt. Many different kinds of trade beads can still be found in the Pacific Northwest regions of British Columbia and the Yukon. Beads gradually stopped being a medium of exchange in favour of the European “monetary” system. They were kept instead as ornaments and decorations and are still a treasured part of indigenous culture and artwork. Beads that have survived over the years have grown even more beautiful as their colors have mellowed into lustrous shades which modern man cannot duplicate. View available pieces of Historical Bead Jewellery here.